It is stirring news that the United Fruit Company is going to try to make the banana as glorious as California has made the raisin. If the advertising man succeeds in sublimating the one unquestionably comic fruit, we will admit he can do anything. We will even go to lunch with him and let him tell us how he did it. – The New Yorker, December 26, 1925. Bananas are the most popular fruit consumed in America. We eat almost as much banana as we do apples and peaches combined. Here’s an interesting thing: Unlike other common fruits, there’s only one type of banana sold in most U.S. grocery stores. Your local supermarket offers a wide selection of apples, plums, and pears; but those big, yellow bananas you see are all the same. I mean this on a genetic level. The bananas in supermarkets are all identical clones of a banana strain called the Cavendish. Now here’s something to come to terms with: The Cavendish is under threat from an unstoppable fungal disease. It’s not implausible that in a few years you won’t be able to find the bananas you like now. It’s happened before. Your grandparents probably grew up eating the Gros Michel, a creamier, fruitier banana that was wiped out by a similar fungal disease no more than a few decades ago. This post tells you everything that happens to a banana between the time it’s picked to the time it gets to a supermarket. As you read on you’ll understand why it will be hard to avoid the death of another banana. Bananas are incredibly difficult to transport. Once packed, the ripening of a single finger ruins the whole box, because they’d all be spoiled before they reach the consumer. The shipping industry knows the right temperature to hold off ripening. It’s called the “banana”: 14 degrees Celsius or 57.5 degrees Fahrenheit. It took a long while to figure out the optimal temperature. Bananas were so easy to spoil that the fast ships used to transport them became known as a “banana boat).” Before they arrived in cartons in the 1960s, bananas used to be shipped imported while still attached to stalks. Even then, many would rot. The key to transporting bananas is to keep them at a pre-ripening temperature until just before they reach the consumer. Once they start to ripen, the process is irreversible. Color is so important that producers have developed a seven-point scale to measure ripeness, where 1 is dark green, 4 is more yellow than green, 6 is full yellow, and 7 is “flecking.” Each of these stages correspond to a different point in the supply chain. The overwhelming majority of bananas are picked and shipped from Central or South America. They’re harvested while they’re still dark green, or stage 1. They’re picked, washed with soap and water, and then packed while still on the field. The boxes and pallets are stored in refrigerated containers called “reefers,” which need to be plugged into the ship to maintain power. They’re kept at “banana” (57 degrees in the summer or 58 degrees in the winter) while they make their way across the ocean. The Dole Food Company is so meticulous in avoiding ripening that it owns and operates its own reefers and container ships to guarantee quality control. 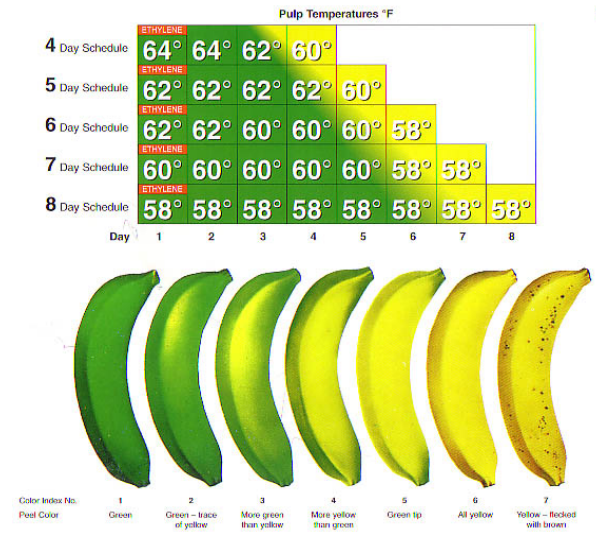 Any lapse in temperature or humidity will allow bananas to release ethylene, which will soon ripen the entire box. By the time the reefers arrive in port, the bananas will have reached stage 2: light green. Before bananas are taken to grocery store, they’re trucked to specialized warehouses. These warehouses have rooms specifically to ripen the banana. Boxes of bananas are placed into sealed rooms, warmed, and then doused in ethylene gas. The room is successively ventilated and sealed over the course of four days. They’re trucked out again to grocery stores after they reach stage 3 or 4. Aren’t bananas wonderful? Their potential spoilage might seem like a drawback, but it’s really a nice thing that they get to ripen themselves naturally. That’s not the case with the peaches and apricots you buy. The reason that so many fruits have such little taste is that they were picked too early, and only have the appearance of being ripe. The banana can achieve maximum sweetness even after it’s picked. It even comes in its own convenient packaging to make it easy to eat. How nice. The Cavendish is currently under threat by a soil-borne fungal disease. Known as Tropical Race 4, it has started to kill the banana in Africa, Australia, the Middle East, and Southeast Asia. The disease has been referred to as the HIV of banana plantations because there is no cure; banana plants have become infected four decades after the disease wiped out previous crops. It’s only a matter of time before Tropical Race 4 travels to Central America to crush the Cavendish. Sound implausible? It’s happened before. The world wasn’t always hooked on the Cavendish. A few decades ago, everyone ate a strain called the Gros Michel. The Gros Michel is a creamier, more fruity version of the Cavendish, one that was also less likely to spoil or bruise. Its skin was more slippery, which is one reason why banana peels have been such a prominent cartoon gag. By the 1920s, though, the Gros Michel was struggling to deal with a fungal blight called Race 1. By the 1950s, the Gros Michel had largely succumbed, and disappeared almost entirely. The United Fruit Company once controlled 90% of the world’s banana market. It tried to ignore the blight. By the 1940s, an upstart called the Standard Fruit Company switched to cultivating the Cavendish, which was resistant to Race 1. Soon afterwards, Standard Fruit became the largest banana seller in the country. Today we know Standard Fruit as Dole, while United Fruit has become Chiquita. The new Tropical Race 4 is much deadlier than old Race 1. The former has way out-evolved the latter. It also doesn’t help that the Cavendish clones represent an extreme form of monoculture. The collapse of the Gros Michel didn’t have a huge human impact, but we may not be so lucky this time. The Gros Michel was largely an export crop, not a staple of the South American diet. But now many more people depend on growing the Cavendish. It’s one of the top export commodities for countries like Panama, Costa Rica, the Philippines, Ecuador, Colombia, and Honduras. The disappearance of the Cavendish will affect their nutrition and livelihood. And this time, there may be no new strain of banana on the horizon to replace the Cavendish. Even if we manage to develop one, the complexities of logistics prevents us from moving on. We’ve had decades to tweak the supply chain so that it’s perfectly optimized for the Cavendish. There’s little appetite to completely rebuild the infrastructure for supporting the production of a new banana. Can it be chilled? Will you need ripening rooms? What will be the right temperature and relative humidity to store them? There have arguably been more exercises in regime change launched on behalf of the banana than on behalf of oil. We have the term “banana republic” because the modest fruit has been so intricately tied to political affairs. United Fruit was once known as El Pulpo—the octopus—in Central American countries. The company has planned coups against the governments of Honduras, Guatemala, and Colombia. Its 1928 crackdown of striking workers in Colombia eventually turned into a massacre, inspiring a scene in Marquez’s One Hundred Years of Solitude. United Fruit was engaged in mischief until the 1960s, when it lent its fleet of fast ships to the CIA’s invasion of the Bay of Pigs; that failed attempt to depose Fidel Castro led directly to the Cuban Missile Crisis. The banana has affected policies closer to home as well. Bananas are such a serious business that South American countries once formed a cartel modeled on OPEC. The tangles between American companies and the Union of Banana Exporting Countries eventually led Congress to create the Foreign Corrupt Practices Act in 1977. United Fruit made the banana popular. It sponsored a hugely-successful marketing campaign, spearheaded no less than by a nephew of Sigmund Freud, to get Americans to love the one unquestionably comic fruit. It advertised the banana as a natural accompaniment to cereal, as well as the cure to blood pressure and constipation. Remember the “home economics” lessons you got in high school? The first were set up by United Fruit in part to spread banana recipes. We wonder if a startup will find a way to market another banana acceptable to consumers. The Cavendish won’t disappear tomorrow. It will take several decades for Tropical Race 4 to ruin existing crops. Will we one day have to tell our grandchildren what bananas used to taste like? 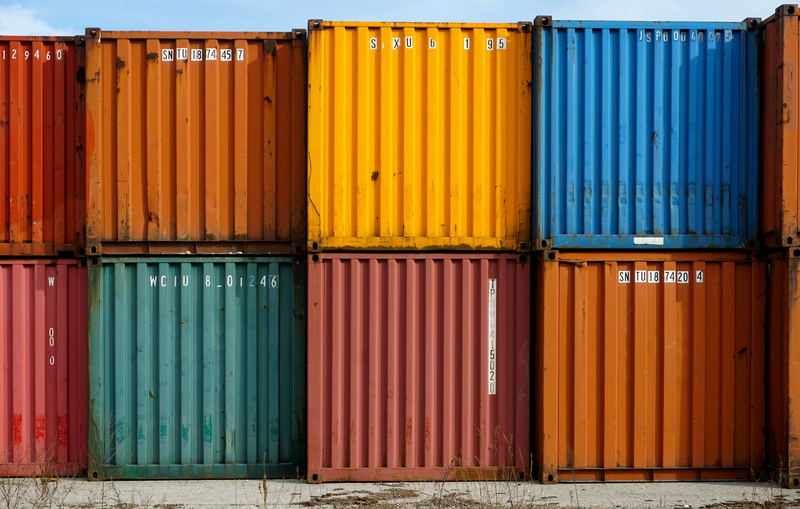 Read this next >> Why Should Dole Own Container Ships?